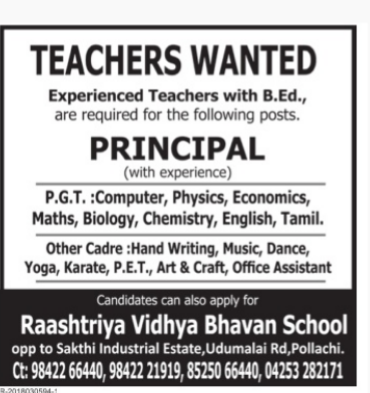 Raashtriya Vidya Bhavan School, Pollachi has advertised in THE DINAMALAR newspaper for recruitment of Principal/PGT/Non Teaching Faculty jobs vacancies. Interested and eligible job aspirants are requested to apply immediately.Check out further more details below. 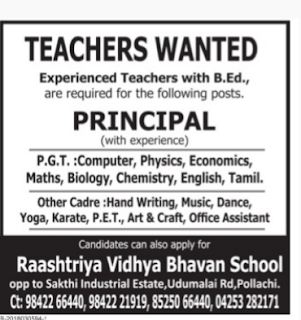 Name of the School: Raashtriya Vidya Bhavan School, Pollachi. (a) Teachers: Experienced Teachers with B.Ed. (c)Fluency in English is Must. How to apply: Candidates can also apply for below mentioned address. Reference: Advertisement on DINAMALAR newspaper Dated 15th April 2018.